Three weeks after planting our garden, it has turned into an organic jungle! Everything has been coming in great, especially with all the rain we have had. We have not used any pesticides on our garden, but we did have to deter some rabbits who ruined our sugar snap pea plants and got into the spinach (see the picture top right). I mixed garlic powder, cayenne pepper and a little bit of natural dish soap with water, spray on the plants about twice a week, and the rabbits haven't come back since! We have also been spraying a mixture of natural dish soap and water on our plants as a natural bug repellent. The cilantro tastes great, and the butter crunch lettuce is just about ready to start eating. There are a few green peppers that are coming in, and we have a ton of green onions. Hope your garden is growing well! What works for you to keep rabbits and bugs away? 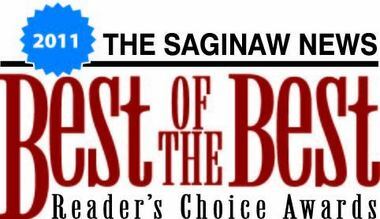 Thank you to everyone who voted for me as a Best of the Best chiropractor in Saginaw! I'm honored to be part of the annual reader's choice awards by the Saginaw News that recognizes the top three Best of the Best in a variety of categories. This is one of the best tasting and easiest meals that you can make. The key to making this meal healthy is finding wild salmon. You can typically get wild salmon at your local fish market or possibly even your local grocery store. Farm raised salmon is a totally different food and doesn’t have the health benefits wild Alaskan salmon does. If you can’t find it locally you can also use canned salmon. Just look at the top of the can for the stamp “Alaska USA,” that means it’s wild. Place the salmon into a dish and mix it really well. If it’s canned it will have bones in it that will break up once you mix it. Add 3 eggs, onions, tomatoes, red pepper and a few dashes of black pepper and mix well. Heat pan on medium high and add coconut oil in the pan. When the pan is heated, spoon salmon mixture into 4-5 inch patties. Cook 2-3 minutes on each side or until browned and flip. I typically add a side of vegetables such as steamed broccoli. This amount should make 5 salmon patties. Eat and enjoy (with a little hot sauce on top)! I always encourage people to buy food as natural as possible so you can add your own salt, seasoning, sugar, dressing, etc. to taste. You always add less than the restaurant or food manufacturer would. It gives you more control over your food and what you are eating. For example, if you are ordering a salad at a restaurant, ask for dressing on the side and add to taste. Choose low sodium soup, add salt to taste. Choose unsweetened tea, add sugar to taste. Choose organic food, add pesticides to taste. Would you ever add insect spray, that "kills on contact," to your food before eating it? Why would you use pesticides in your garden as your fruits and vegetables are at their most vulnerable state? Buy and grow organic produce! Then it is your choice if you want to add pesticides to taste. On a budget? Learn what fruits and veggies are the most important to buy organic. 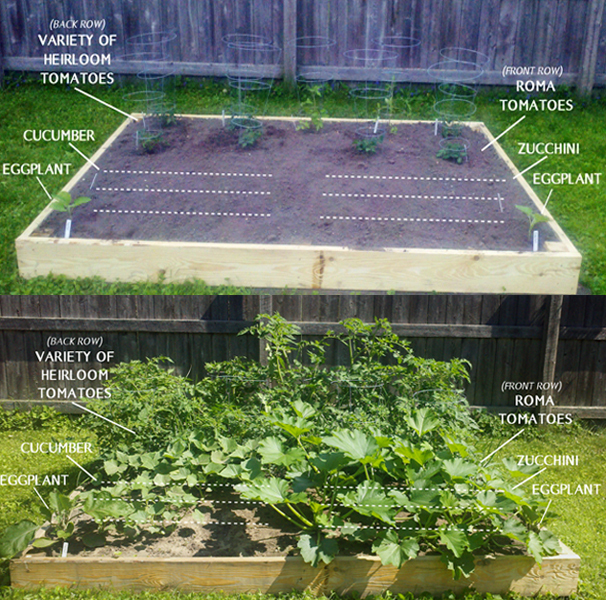 We recently built raised beds for our garden (learn how we did that here). Here is how we laid out the garden, planning for the taller plants in the back of the garden, so they didn't block the shorter plants from sunlight. We also put the green vegetables rabbits seem to favor in one bed and placed a small fence around it. 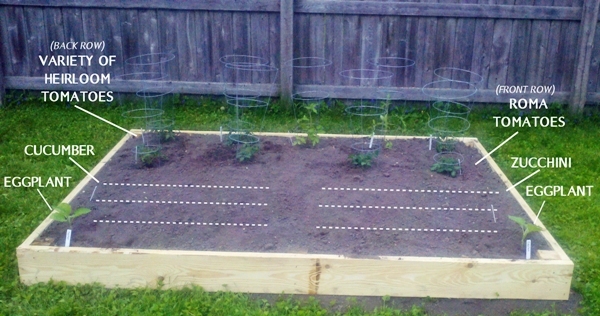 Our garden is going to be chemical free, caring for our plants naturally and organically. There are a combination of seeds and plants, and everything we bought was either organic or heirloom (meaning that nothing is genetically modified). For the herbs we don't use while fresh, we are planning to use our dehydrator to make dried spices. ﻿﻿﻿﻿﻿Do you know where your fruits and vegetables come from? What chemicals are used on them? Are they genetically modified? 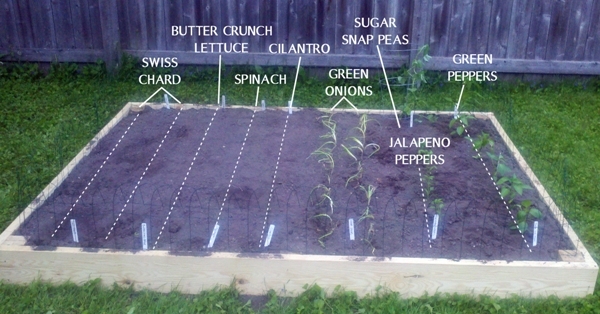 If you grow your own food, you will know exactly how they are grown. This is the first year we've had an opportunity to put in our own garden. We're learning as we go, will share our experience and we look forward to hearing tips from others! We decided to build two raised garden beds, it was very easy to do. With help from my dad, it only took an hour and a half to build. Visit your local hardware store to buy the wood you are going to use. We decided to make two 6 ft. x 8 ft. raised beds. I bought four 8 ft. by 8 in. boards and four 6 ft. by 8 in. boards of untreated wood with no chemicals, and deck screws to secure the boards together (which cost around $40). Find a spot in your yard that gets a good amount of sunlight and is the ideal location for a garden. Be sure to leave enough room around it for a mower if you build close to a fence or two right next to each other. Try to find free labor if possible (thanks Dad)! We bought two 12 ft. boards and cut in half to have four 6 ft. boards. Screw them together to create your frame. Place the frames in the area you want and secure them with stakes in the corners. You can screw the steaks to the frame with deck screws. This will keep your garden from bowing and shifting when you add dirt. One full trailer load was enough to fill both beds, and it only cost $20. Have your free labor fill the frames up with dirt! It's going to settle a few inches so be sure to fill to the top. 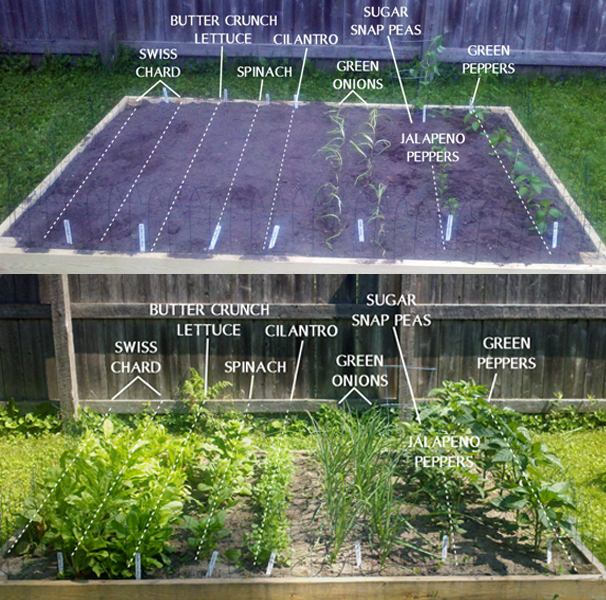 Stand back, admire your raised garden beds and get ready to plant!